It's June, and time for the next generation Apple iPhone 4. Some of the surprise may be missing this year, but it's fascinating to see how Apple has redefined this product -- originally as an iPod music phone, then as an App phone, and now as a Video phone, complete with an HD video camera with LED light, a second inward-facing camera, plus FaceTime software for video calls and an iMovie app for editing and sharing your movie. Interestingly, Apple actually is working its users in two directions: first positioning the iPad as a media consumption device for passive viewing (i.e., with no camera), and now re-positioning the iPhone as an active, creative device to shoot and edit and share (albeit on a smaller screen). This focus on lots of flowing video also goes against AT&T's recent move away from unlimited pricing, so, for example, the video calls will only work over Wi-Fi, and not over the wireless broadband connection (and only communicate with other iPhone 4 devices). The new iPhone steps up further as an audio / visual device with the "retina" display, featuring four times the pixel resolution of the previous model, from 480 x 320 to 860 x 640 (compared, for example to 800 x 480 on the Verizon / HTC Droid Incredible). At these resolutions (326 pixels per inch) you no longer notice the individual pixels. The new iPhone also adds a second microphone for reducing background noise. But the iPhone is more than features and functions, as expected from Apple it's also an impressive piece of design -- not just the look and interface, but the industrial design to squeeze more magic into an even smaller form. Apple started by squeezing the thickness by 20 percent, from 0.48 to 0.37 in. (compared to 0.47 in. for the Droid Incredible or 0.33 in. for the iPod touch). The other dimensions and weight remain the same. The exterior then is enhanced with hardened glass panels on both the front and the back, which are scratch and fingerprint resistant, supported by a stainless steel band around the sides (which also works as the antenna). The device also now includes a three-axis gyroscope for more expressive motion gestures. And still there's room for a larger battery for increased phone talk and video playback time. Along with the new iPhone, Apple announced a new software update, now called iOS 4, with real multitasking for background apps, folders to organize thousands of apps, a unified e-mail inbox, iBooks app for the iBookstore, and iAds for the joys of mobile advertising, among a hundred some new features. The new iPhone 4 ships June 24 at the same introductory pricing as its predecessor, $199 for 16 GB flash memory, and $299 for 32 GB. Meanwhile, the previous iPhone 3G S will now be available for only $99 with 8 GB of storage (see last year's post). As usual, do check out the Steve Jobs keynote introducing the new iPhone as a wonderful example of showmanship. Apple also has posted an iPhone 4 Design video with plenty of superlatives, and a video showing the FaceTime video calling. I'm continuing to appreciate the Kensington line of portable batteries and chargers for iPods and other portable devices (see earlier post). For example, the Kensington Rechargeable Pocket Booster is a clever option for having an auxiliary power boost on the go. It's a portable battery with a USB outlet, so it works with lots of handheld devices. (It comes with a mini-USB cable and micro-USB adapter, or you can use the cable that comes with your device, i.e., the Apple iPod cable). Plus -- the Pocket Booster is powered by two rechargeable NiMH AAA batteries, so you can not only recharge it easily (there's a USB connector under the end cap), but you also can swap in additional batteries if needed to keep on charging. And, as a bonus, you even can pull out the batteries in a pinch to use them for other portable devices, such as a Bluetooth mouse. The Kensington Pocket Booster is small and light (2/3 ounces), and priced at $34 (around $19 street). Then for charging up your collection of devices, the Kensington 4-Port USB Charger for Mobile Devices has outlets to spare, with four USB power ports, so you can charge up to four mobile devices simultaneously. You can use your existing USB charging cables, or check out the Kensington line of USB Power Tips for various devices. The Kensington 4-Port USB Charger is priced at $29 (around $19 street). Audio headphones used to mean fat padded ear muffs and thick coiled cables. Today's styles can be much more minimalist, complimented by impressive audio processing. Case in point: the Plantronics .Audio 476 DSP foldable USB stereo headset. This is an over-the-head stereo headset with plug-and-play USB connection. It's lightweight and comfortable, and folds almost completely flat for travel. But this is much more than a headset for music -- it's designed for today's much broader range of uses, including music, movies, video games, and communications. For listening, the .Audio 476 features DSP processing, with 24-bit hi-fi stereo sound and acoustically tuned digital equalizer. Plus, it has three-button inline controls, for volume up/down and mic mute. And for speaking, there's the noise-canceling wideband boom microphone, with 48 kHz sampling rate and 16-bit output. The processing also extends to wideband acoustic echo cancellation for clearer and more natural speaking. The result is to provide great sound that's convenient to carry and comfortable to wear. The Plantronics .Audio 476 list for $54, and is available at street prices around $35. The new Flip Video SlideHD pocket camcorder extends Flips's focus on shooting (simple operation) and sharing (with software for easy editing and uploading) to showing -- with a bigger slide-out 3-inch widescreen display. Flip Video (now part of Cisco) has always focused on simple-to-use pocket camcorders -- just power on, wait a couple seconds, and press the big red Record button to start shooting. There's no modes and no confusing options, so you're always ready to shoot, and never caught fumbling to set up the right format. The trade off for this aggressive simplicity, of course, is that these are not multi-purpose devices. Flip camcorders don't shoot still photos, or provide a choice of video resolutions or quality levels. (And the HD models are 720p, 1280 x 720, not full HD 1920x1080). They come with a fixed amount of built-in storage, and don't support removable memory cards. Instead, Flip offers several models with fixed specific combination of features -- the Flip Ultra for standard res, UltraHD with removable batteries, and MinoHD models with 1 and 2 hour recording times (see earlier post). These compare to pocket camcorder models from other companies including Creative, DXG, JVC, Kodak, RCA, and Sony, with aggressive pricing and arrays of features, also including Web video resolution, normal / macro focus, image stabilization, face tracking, slow motion playback, and flip-out displays. So the SlideHD goes in a different direction, not adding new shooting features, but instead focusing on sharing your fun by showing the video on the 3-inch display (compared to 2 inch on other Flip models). 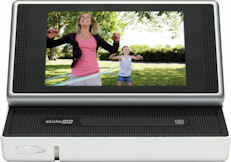 When closed on the back of the unit, the display is split in half, with the top showing live video when shooting (or playback of stored clips), and the bottom displaying the standard Flip recording and playback controls, now implemented on the touch screen instead of with physical buttons. Then slide the display open, to pop up at a 45 degree angle for viewing your clips. Now the video fills the display, in full widescreen. There's a touch strip below to quickly flip through the stored clips, plus a menu button on the slide for settings, or (not too obviously) you can press and hold on the display to bring up play and volume controls. The Flip SlideHD stores 720p video in MPEG-4 format (MP4) for easy viewing with Windows Media Player, QuickTime Player, iTunes, and the like. It records 4 hours of video in the 16 GB internal memory (the other Flip models provide 1 and 2 hours), and you can also download your own photos and videos for viewing. However, the non-removable battery provides 2 hours of use before it needs to be recharged. You can charge from a computer USB port, or using the Flip power adapter (sold separately), but not from typical USB wall or car adapters. The SlideHD includes an HDMI mini connector to play on directly on an HDTV (cable sold separately). Or use the built-in FlipShare software to browse, download, organize, edit, and share your videos -- run directly from the Flip camcorder's memory (when mounted over USB) or download from the Flip site. FlipShare version 5.0 adds support for displaying on television though the new FlipShare TV set-top box, and sharing to mobile phones using the free FlipShare Mobile app for iPhone, Blackberry, and Android devices. See my Digital Camcorders Gallery for more on the Flip line and other digital camcoders. It's the era of high definition, shooting with equipment from professional video cameras and video DSLRs, to HD consumer camcorders, and even small pocket camcorders. But how can you share these productions in their full HD glory? One answer is to export your HD video clips to play back directly on a PC, for example in QuickTime or Windows Media Video format. You also can share online by uploading in HD to video sharing websites, usually in Flash or MPEG-4 / H.264 formats. Or you can view and share your production in your own home, and with others, in full HD quality on your big widescreen HD display by burning to Blu-ray disc. With new releases of video tools like Corel VideoStudio Pro X3 and Adobe Encore CS5, you now can choose from several varieties of HD disc designs, from authoring basic Blu-ray discs with DVD-like menu screens, to Blu-ray pop-up menus overlaid on video, and even burning in widescreen AVCHD format to standard DVDs. For more on your options in using Blu-ray to share your HD productions on physical discs, see my full article, DVD Creation within the Blu-ray Format, Videomaker magazine, August 2010. 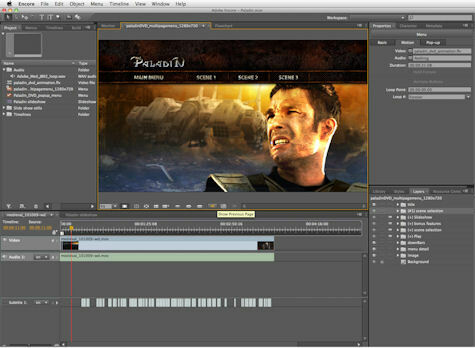 - See my article - Walkthrough: Corel VideoStudio Pro X3, for a summary of the VideoStudio Pro applications and features. - See my article, Summary: Adobe Creative Suite 5, for a breakdown of the tools and suites, and highlights of what's new with the CS5 applications. - See my Video Editing Software Gallery with for more on Corel VideoStudio Pro X3 and other video editing tools. - See my DVD Authoring Software Gallery for more on Adobe Encore and other DVD authoring tools. Find Corel VideoStudio Pro X3, VideoStudio Express 2010, and the Photo & Video Pro X3 Bundle on Amazon.com. Find Adobe Premiere Pro CS5, Adobe CS5 Production Premium, and Adobe CS5 Master Collection on Amazon.com. Entries posted to Manifest Tech Blog in June 2010, listed from oldest to newest.